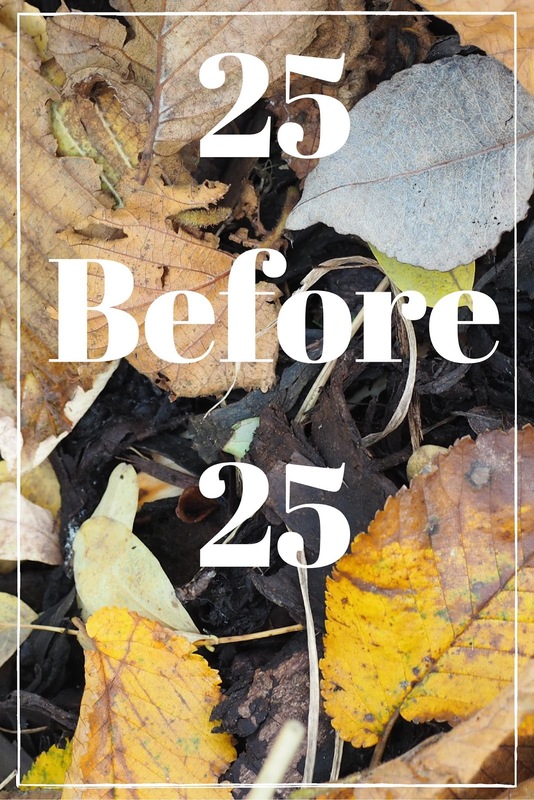 Yep, that's right this post is a 25 before 25. The very fact that I'm writing such a post makes me feel old. Not that twenty five is old but the fact I'm even thinking about turning twenty five makes me feel old . I feel old being twenty two. I think it's also to do with the fact that I've just graduated university and am officially adulting. Which I am totally not ready to do. Who knows if I'll ever be ready. Seeing as I am the ripe old age of twenty two I thought it would be the perfect time to put this post together. That way I have three years to actually do the things on the list. I wanted to make my list as realistic as possible but still as exciting as possible. So after great thought here's the twenty five things I decided upon. This is something I'll hopefully be doing in 2017. I've just started my online TEFL teaching course and am hoping to go to Vietnam for six months or so to teach. I was going to make this 25 countries seeing as it's 25 before 25. My current country count is 22 so I didn't think 25 would be that much of a challenge so have changed it to 30 instead to make sure I travel as much as possible in the next three years! Over the next three years I want (NEED) to figure out what I actually want to do. At the moment I'm looking into marketing roles. After my gap year of travelling I really need to sit down and start working towards a career. The perfect scenario will be that by the time I turn 25 I'm working in the sector I want a career in. Bonus points if I actually like it. This is something I wish I could do at the moment but it's just not the right time. Part of getting a proper job will be moving away. I live in a small town and don't really want to spend my life here. I'd love to move to a city and enjoy the city life that I loved at university. I haven't driven since I started university. I was always a nervous driver but by the time I left for university I felt much more confident. Having not driven in so long I'm almost starting again so I'd love to start driving again and actually enjoy it rather than stressing out every time I have to drive somewhere! This has been on my travel bucket list for a very long time. Hopefully (fingers crossed) it will get ticked off in 2017. I've always wanted to stay in an igloo and watch the Northern Lights. They look sooo amazing! I've had quite an on/off relationship with blogging over the years. Hopefully, now I'm blogging about what I truly love I'll still be at it in three years time. Who knows what the blog will look like then! Or what opportunities I may get in the next three years! It's quite exciting to think about. This is something I have on my 101 in 1001 days list but that finishes in April so I thought I may as well add it onto this list and read another 50 books! The most solo travelling I've done is spending the day alone in Warsaw because my flight was at 10pm whilst my friends flight was at 11 am. It wasn't as bad as I imagined but I still felt pretty lonely and that was just a day! But I need to push myself outside of my comfort zone, plus solo travelling will mean I don't have to wait until my friends are around to come with me. I can just go whenever I want! Mmmm. Not sure this will ever happen but I can be hopeful. Maybe in the next three years things will change. Maybe I'll love getting up early. I am incredibly lazy when it comes to exercise but I need to start looking after my body. This means less eating rubbish and more taking care of my body. This isn't just to lose weight but to maintain a healthy lifestyle. Yep, I've never had a bra fitting and I probably (definitely) should. I don't even know if the bras I'm currently wearing even fit properly so over the next five years (preferably sooner rather than later) I should find out whether I'm even wearing the right size. You know some people know exactly what drink they want? I want to be that person. I want to go into a bar and know that I'm going to have my favourite drink which doesn't give me a killer hangover the next day and that I enjoy no matter what. This may sound like an exaggeration but it's not. OK maybe it is. I can run for 20 seconds without keeling over and dying. Hopefully this will change. I'm yet to start the 30 day shred I wrote about in my November goals but maybe I'll succeed in the next month (year) or so. I met Lili whilst travelling around Europe and we clicked straight away. Which was great. Except she lives in Western Australia. So basically on the other side of the world. She's been in London for a couple of months so I went down to see her and promised I'd visit her in Australia. And I really want to keep this promise. Because then I get to see Lili and visit Australia! I'm hoping I can take a trip to Australia as part of my long term travel next year but if not I want to get to Australia before I'm 25. Technically I've been camping at a music festival but I want to go camping where I wake up and go for nice country walks rather than wake up and discover that someone has peed up my tent. I started to learn chess in India when we bought a mini chess set to keep us occupied. However, turns out we were playing it wrong even though we were following instructions! So I need to start over. I've found a chess set at home so hopefully my dad can teach me at some point. I've been debating whether to get a tattoo for about four years now. I nearly got one whilst I was travelling Europe but I left it too late and wasn't quite ready. I think I know what I want so I just to pluck up the courage to actually get it! I've always travelled with my friends but usually only in a pair and even when we were a group it was still backpacking. I'd love to go on a holiday, where I pack a suitcase full of really nice clothes. An outfit for each evening! And drink cocktails around the pool. A girl can dream! I worry about everything. I over think everything. If I have to walk to the post office I worry about how long it will take, who I'll bump into, what I'll say when I actually get there. I need to learn to worry less and be more relaxed in situations. This is something that will take time. I'm definitely better than I was before I went to university so hopefully over the next five years I'll improve even more. This one sounds really vain but I actually never take pictures of myself. I only ever take selfies with someone else. I've only just started getting more pictures of myself travelling. I normally snap pictures of others or scenery and spend less time trying to get one of myself. I want to change this because, as my friend says, I'm at my prime age and should be making the most of it. We're at the perfect age (apparently) so I should be documenting this otherwise all I'll have to look back on when I'm older is lovely pictures of others and none of myself! I feel like I've done quite well with this so far but there's still room for improvement. As mentioned in 21 I worry a lot which sometimes stops me from doing things and this sometimes means I miss out on really good opportunities. This doesn't necessarily mean I still want to be in touch with everyone, people do grow apart but I want to still be in touch with the friends that matter. The ones where it doesn't matter how long we've been apart, we still talk like we live with each other everyday. The ones who want to make the effect. I'm constantly seeing clothes that I love but then thinking 'I can't wear that'. Sometimes because I don't think I'm cool enough to pull it off, sometimes because I don't think it will suit me. But you know what, who cares? Why should I worry bout whether I'm cool enough, if I like something I should rock it anyway! So there's my 25 before 25. Hopefully I'll be able to achieve all of these over the next three years or so. I may do update posts whenever I tick one off. 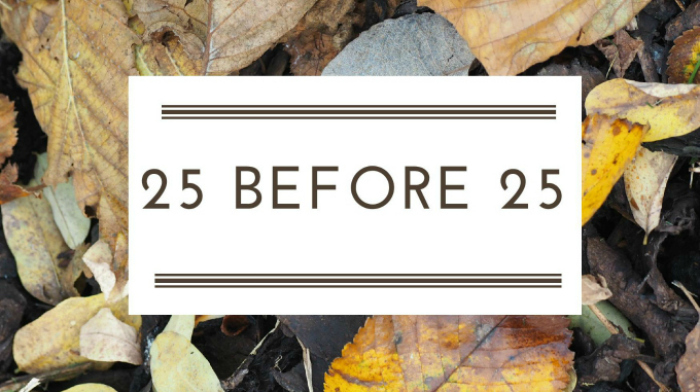 Do you have a 25 before 25 list? If you do then leave your link as I'd love to read them! Aw this is a lovely list of things to do before you reach 25! I think travelling solo seems like such a nice thing to do and really get to know yourself. I'd love to try it but I think you have to be so brave! I completely agree about taking more pictures of yourself when you're at this age - it will be so nice to look back on when you're older! St Patricks day in Dublin would be incredible!